The podium positions have remained the same over the last 24 hours and, with under 3,500 nautical miles to go, Sanya Serenity Coast continues to be in front with Dare To Lead in second and PSP Logistics in third. Sanya Serenity Coast was the first to break through the wind hole, with Skipper Wendy Tuck explaining: “The crew worked really well keeping the boat moving. We had the Code 1 (lightweight spinnaker) up and managed to keep it flying. With around 3,600 nautical miles to go, Visit Seattle remains in fourth place just ahead of GREAT Britain and Qingdao, who have leapt up to fifth and sixth place respectively and can now see each other on AIS (Automatic Identification System). GREAT Britain Skipper, Andy Burns, reports: “As far as I can see from the position reports we get we are still very much in the mix and are now heading our best course east after our second wind hole in the Southern Ocean hit just behind Visit Seattle who we have on AIS. Liverpool 2018 has slipped a couple of places to seventh place after a break in the weather whilst Unicef has climbed up to eighth after the wind returned on the nose. 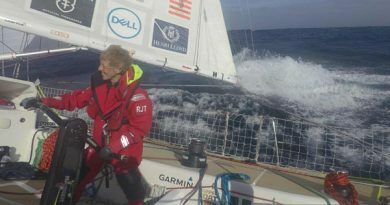 Unicef Skipper Bob explains: “Back to life at 40 degrees, further south than yesterday with a wind direction that has a southerly element means it’s time for helming gloves. 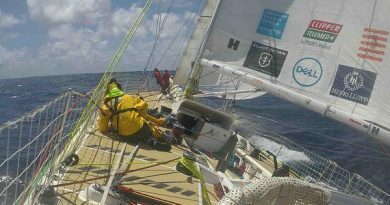 Clipper Race meteorologist, Simon Rowell, has explained the unusual conditions for the Southern Ocean being due to the Jet Stream being quite far north, which is why the low-pressure system is so far north. The fleet should begin to see the influence of the following high-pressure system and the wind should gradually veer and ease as the ridge approaches from the south.